These li'l Mexican treats are so stuffed, they're almost guaranteed to crack a bit when you bake 'em in the oven -- hence the name "Exploding." De verdad! Remove chicken mixture from the fridge, and drain any excess liquid. Add cheese and taco seasoning, and mix to combine. This is your filling. Set aside. Prepare a baking sheet by spraying with nonstick spray, and set it aside. Take one tortilla (keep the rest between the paper towels), spray both sides lightly with nonstick spray, and lay it flat on a clean dry surface. Spoon about 2 heaping tbsp. of filling onto the tortilla. Spread it evenly across the entire surface, and roll tortilla up tightly, so that you have a cigar-shaped tube. Secure with toothpicks and place seam-side down on the baking sheet. Repeat with remaining tortillas and filling. Bake for 14 - 16 minutes, until crispy. Allow taquitos to cool for 5 minutes. If you like, dunk in enchilada sauce, salsa, or sour cream! Today, March 31st, is Oranges and Lemons Day. If you know any limes, be extra-nice to them today. They're probably feeling a little left out. Exploding with excitement? 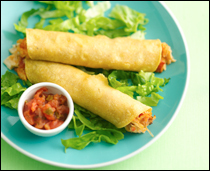 Click "send to a friend" and pass this taquito-tastic recipe along!